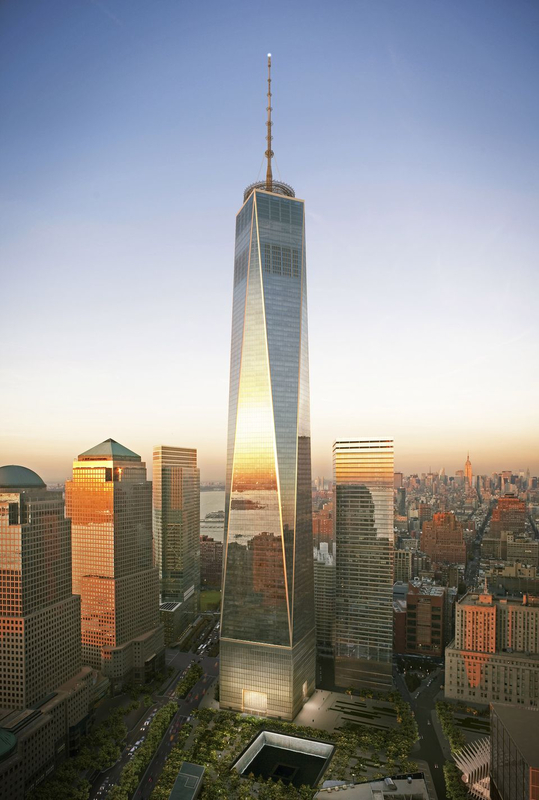 One World Trade Center (also known as 1 World Trade Center, 1 WTC, or Freedom Tower) is the main building of the rebuilt World Trade Center complex in Lower Manhattan, New York City. 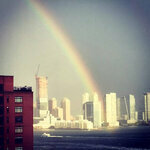 It is the tallest building in the Western Hemisphere, and the sixth-tallest in the world. 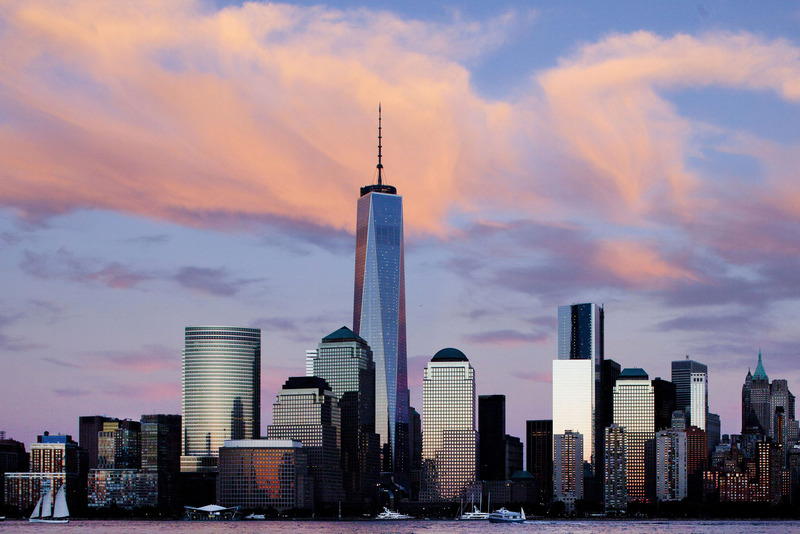 The supertall structure has the same name as the North Tower of the original World Trade Center, which was destroyed in the terrorist attacks of September 11, 2001. Tears flowed and bells tolled at Ground Zero as Americans marked every year the anniversary of the 9/11 attacks in a rare moment of unity for a country still shaken by the horrific terror strikes. Presidents Barack Obama and George W. Bush accompanied by First Ladies Michelle Obama and Laura Bush stood together in New York for the main ceremony at the site of the destroyed Twin Towers. 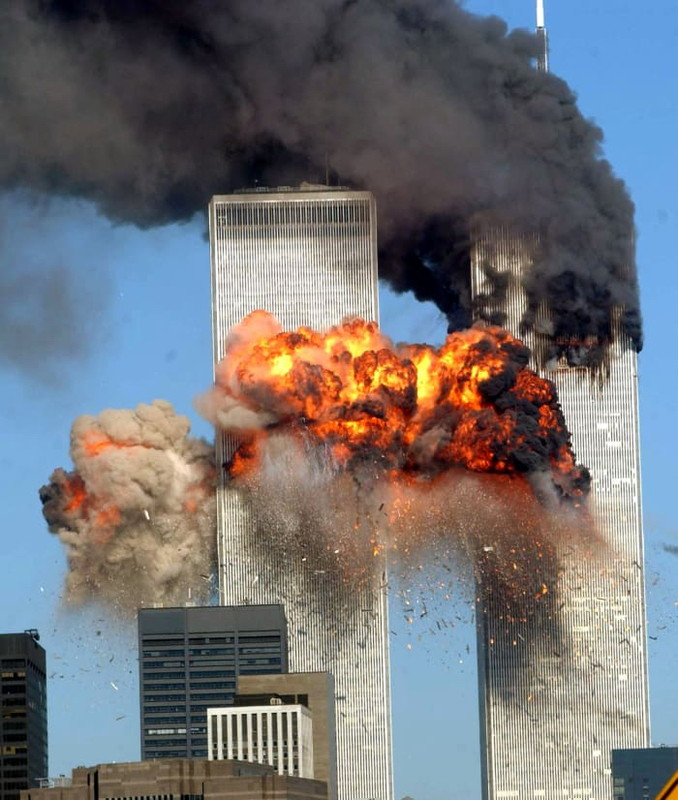 The September 11, 2001 terrorist attack killed an estimated 3,557 Individuals. Many rescuers and first respondents are still suffering the physical and emotional consequences of this horrific attack. Community of Lights joins the commemoration of the Anniversary of 9/11 by paying tribute to those who lost a friend or a family member during the tragic events of one of the saddest day for America and the world. Following the passage of federal legislation that formally established 9/11 as a National Day of Service and Remembrance, a consortium of influential private and government entities unveiled plans to organize the largest day of service in U.S. history in 2011 in observance of the 10th anniversary of the September 11 attacks. 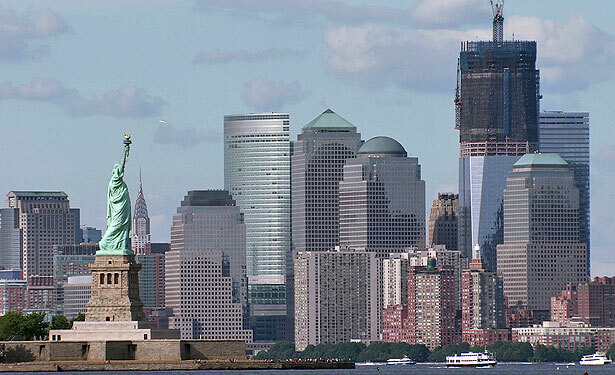 MyGoodDeed led the successful eight-year effort to secure federal establishment of 9/11 as an annually recognized National Day of Service and Remembrance, signed into law by President Obama in April 2009. Also supporting these activities as members of this alliance are the federal Corporation for National and Community Service, HandsOn Network, and the National September 11 Memorial & Museum. "No other day has the power of 9/11 to transform our collective understanding and commitment to service, and to engage people to step forward to help others," said David Paine, president and co-founder of MyGoodDeed. 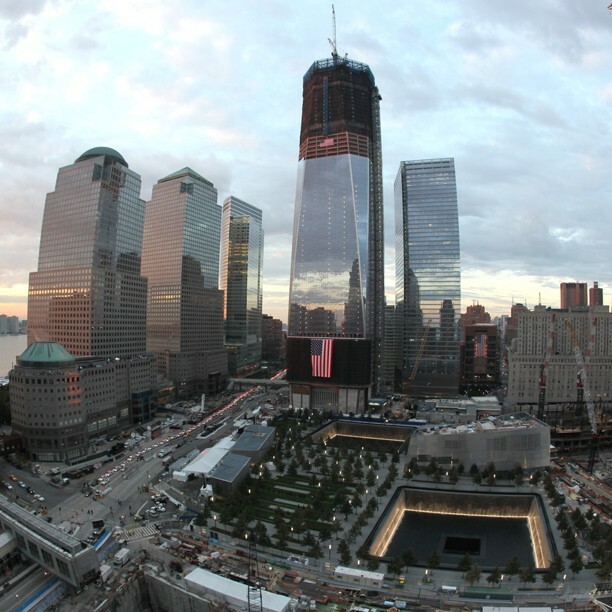 The National September 11 Memorial opened as planned at the site of the World Trade Center on the 10th anniversary of 9/11, and the Museum is set to open one year later, with service as an important element of its exhibits. "As part of telling the story of 9/11, the museum will document the remarkable spirit of unity and service that emerged in response to the 9/11 attacks," said Joseph Daniels, president and CEO of the National September 11 Memorial & Museum. "The 9/11 Memorial hopes to inspire a continuation of this spirit for generations to come." 64 passengers and crew aboard American Airlines Flight 77 that crashed into the Pentagon, killing them and 125 people in the building. 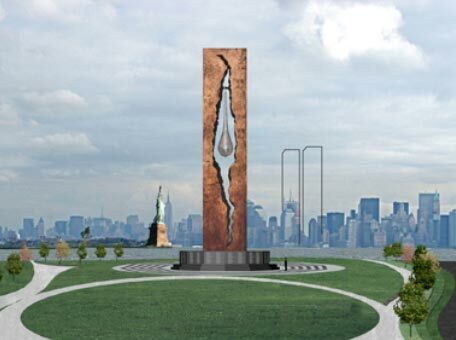 Internationally renowned Russo-Georgian artist Zurab Tsereteli unveiled in Bayonne, New Jersey during the 5th Anniversary of 9 11 a monument titled " The Tear Drop" dedicated "To the Struggle Against World Terrorism". At 100 feet tall, the bronze sculpture on the Bayonne waterfront is hard to miss. 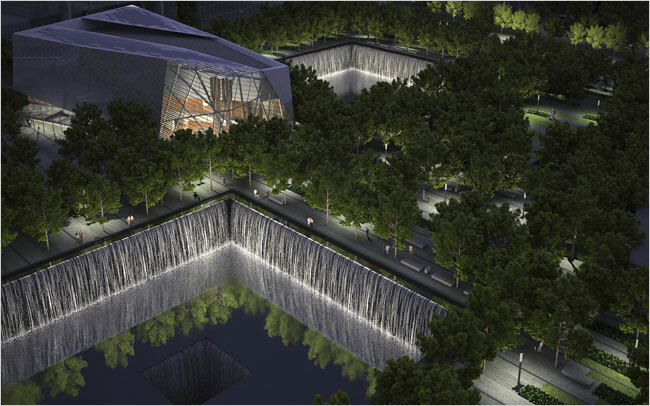 The massive memorial evokes the World Trade Center that once sat across the Hudson River. Jagged lines divide the monument into two tower-like pieces, and a 40-foot steel teardrop gently hangs in the open center, like a bell. Artist Zurab Tsereteli dedicated his 175-ton work, which sits on a former military base, past the entrance to a cruise terminal, at the tip of a peninsula. The Statue of Liberty is just across the water. "From here if you looked at the trade towers, they looked as if they were blended as one," Tsereteli said through a translator, his 28-year-old grandson Vasili, pointing across the water. Tsereteli said the tear symbolizes "sadness over grief that will become happiness in the future when terrorism is defeated." Edged in granite slabs on the monument's base are included the names of the people who died in both World Trade Center terrorist attacks, the one that took place in 1993 and Sept. 11, 2001. There's some question about the accuracy of the names on the base. The memorial lists 3,024 names, according to the artist's attorney. That's 45 more than the official count of 2,979, which includes six people killed in the World Trade Center bombing in 1993 and the 2,973 killed on Sept. 11, 2001 in New York, Washington and Pennsylvania. Dykers' design is notable for its directionality. Unlike the soaring towers, which rose higher than any building in the city, the memorial builds downward, and exists for the most part underground. 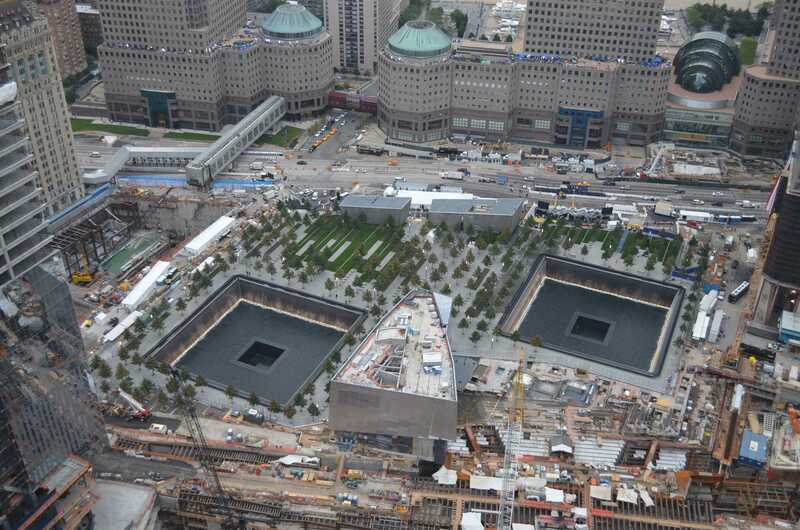 The only above-ground structure houses two surviving trident-shaped columns that once adorned the bottom floors of the twin towers in a glass atrium next to a staircase that leads down into the main space of the memorial. 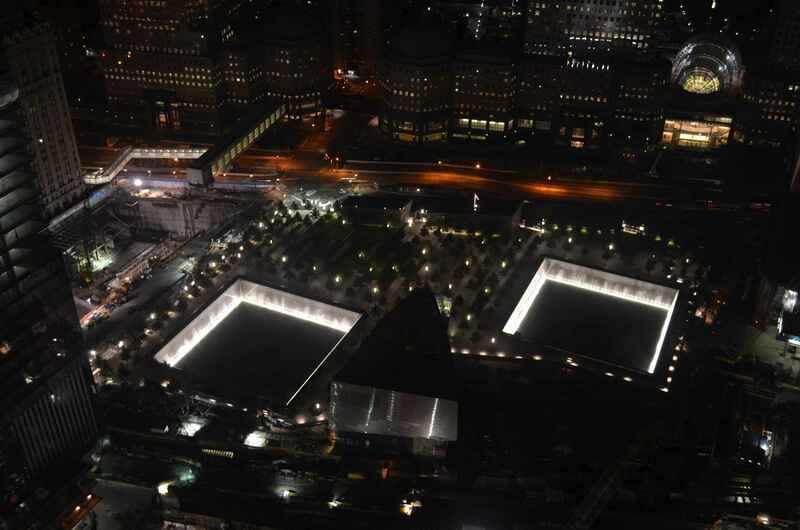 Adjacent to the building, the footprints of the towers, vast and flat, are transformed into square waterfalls that descend into deep pools, giving the illusion that the water falls infinitely. It is as if the collective grief of the city, and of the nation, has formed a cavernous space (both metaphoric and real) inside Manhattan's bedrock. The memorial takes a visitor spelunking into its inner recesses. The design is bold and also provides what will be a haunting and beautiful public space for remembrance: a wooded public plaza between the pools and the building. 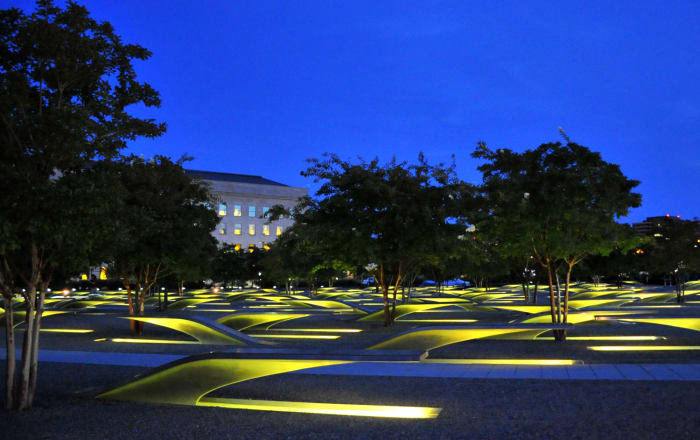 In the absence of a permanent memorial, the city has for the past five years presented the "Tribute in Light." 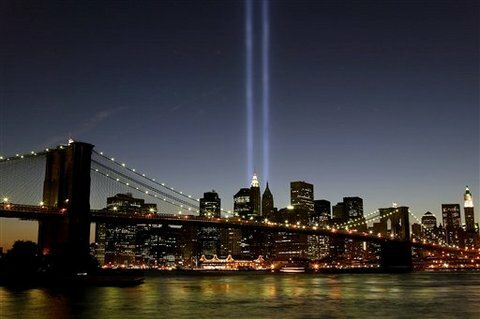 Two towering beams of light that emanate from ground zero and adorn the night sky. It is a striking, beautiful display that in its stark, ethereal majesty offers a visual reminder of what was lost. Methods of making memory solid have varied considerably at ground zero and have been the cause of consternation and controversy for years. This, however, has not been the case around the country. Memorials have proliferated at commuter rail stations, town halls, libraries, public parks and schools. Nor has it been the case in New York City itself. Murals, plaques, reliefs, statues and street signs signify the memory of that day across the city. As of 2003, 217 city streets had been renamed in the honor of victims of 9/11. According to the Web site 911memorials.org, there are 28 memorials in the five boroughs alone, not counting street-side murals and individual fire station reliefs. From paper coffee cups to the sides of tour buses, the city lives in constant, moving memorial of that day. But memorials aren't limited to the city. New Jersey probably has the most 9/11 memorials. 911memorials.org lists exactly one hundred of them. 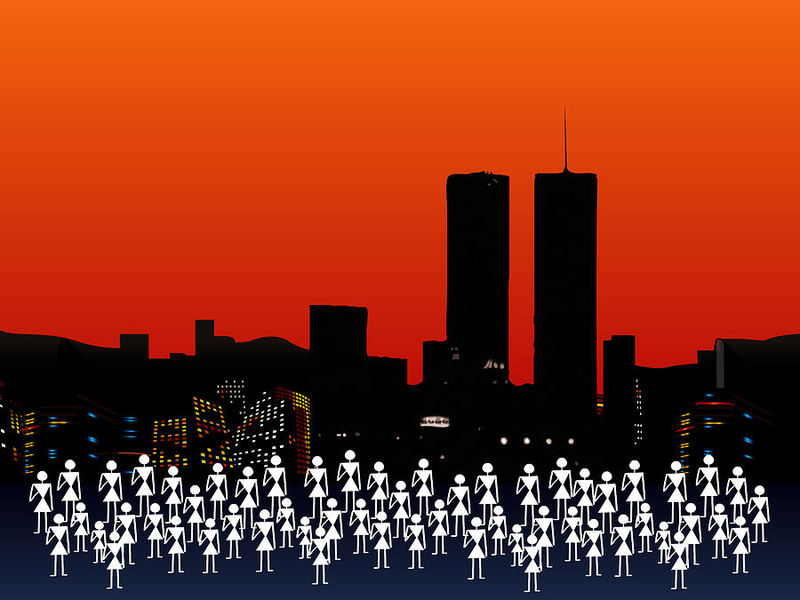 Commuter towns dot New Jersey's suburban landscape and were the hometowns of many 9/11 victims. From Shrewsbury to West Orange, Carteret to Tinton falls, there are small, modest memorials that honor victims, firefighters and emergency workers and express the loss felt by these communities. Many use twisted steel from the towers as the centerpiece, like Green Brook Township's Garden of Remembrance or the Mantua Township 911 Memorial in Sewell, NJ. 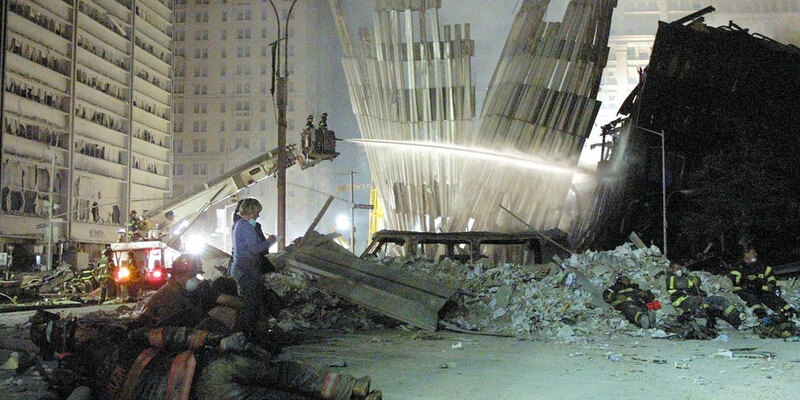 Remnants of the towers themselves, often contorted, charred pieces of steel from structural I-beams, are of particular resonance. 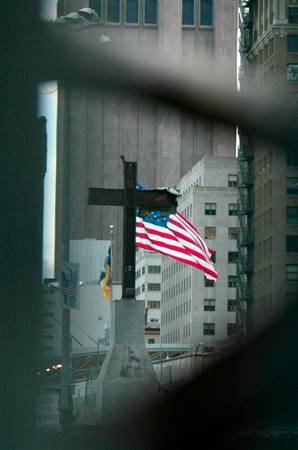 A cross-shaped beam found in the ruins of 6 World Trade Center is currently in Battery Park. The beam traveled around the world, to twenty-five cities collecting written prayers and signatures. 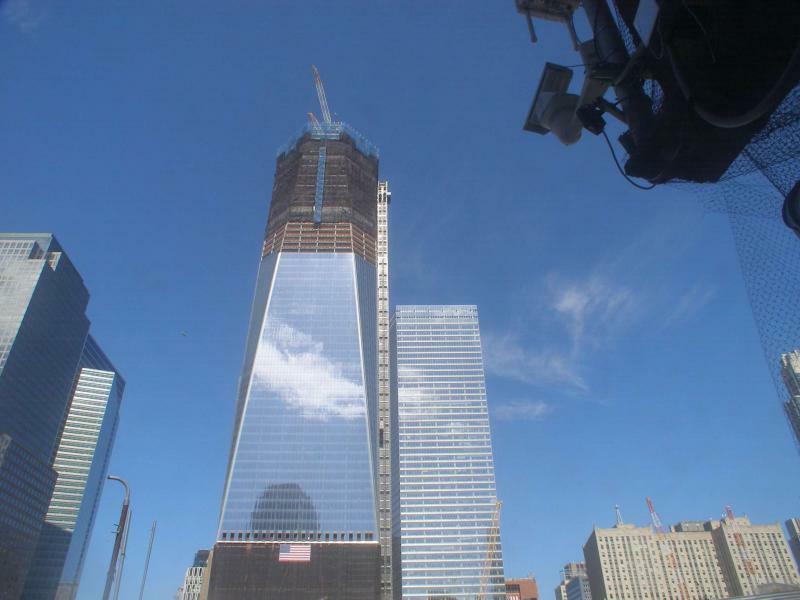 It is now collecting prayers from New York's residents and will be displayed prominently in the National September 11 Memorial and Museum, once completed. Steel from the towers was transported across the country in a large convoy in 2002. It was paraded through state capitols and brought down the strip in Las Vegas and will be made into memorials in far flung locales like Rancho Cucamongo, Calif and Dunseith, North Dakota. Rancho Cucamongo's plan for a memorial is ambitious. 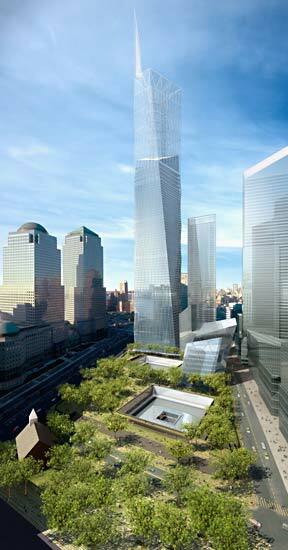 It will be constructed of 35-tons of WTC steel, depicting a large flame that acts as a sundial. On September 11 of every year, the sundial will cast a shadow that demarcates the events of that morning: the first tower being hit, the second tower being hit, etc. Rancho Cucamongo plans to build two "freedom flames" and offer one to the City of New York as a gift. The most famous memorial given to New York sits across the Hudson river in Bayonne, NJ. The government of Russia gave the memorial, which looks like a large tear encased in broken steel, as a monument "To the Struggle Against World Terrorism." 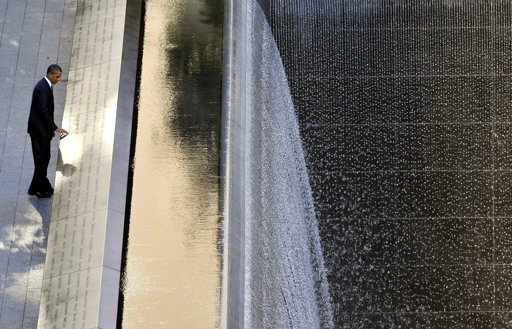 It weighs 135 tons and has the names of 3,024 victims of September 11th, a number that has been disputed, but includes victims from the WTC, the Pentagon and from United 93. 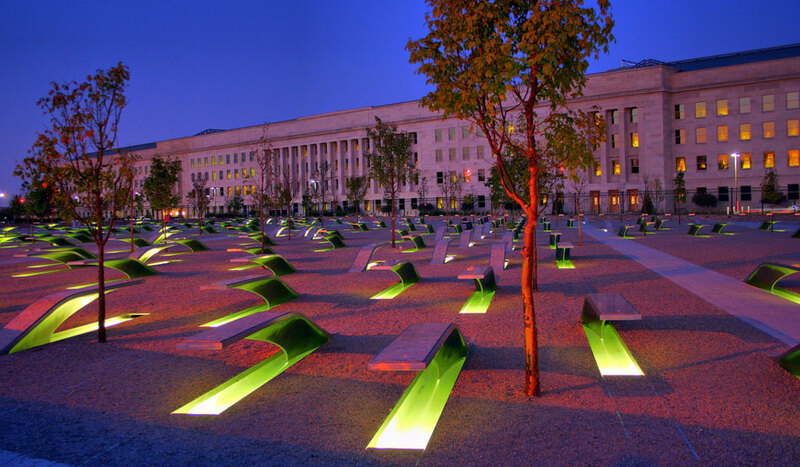 On September 11, 2011 the Pentagon Memorial opened to the public in Arlington, VA. It was designed and built swiftly and consists of 184 benches to represent the 184 victims who died there. Designed by architects Julie Beckman and Keith Kaseman, the benches are stainless steel. They are sleek, suspended at one-end, and lit from below. Ground was broken on the memorial park in 2006 by then-Defense Secretary Donald Rumsfeld. 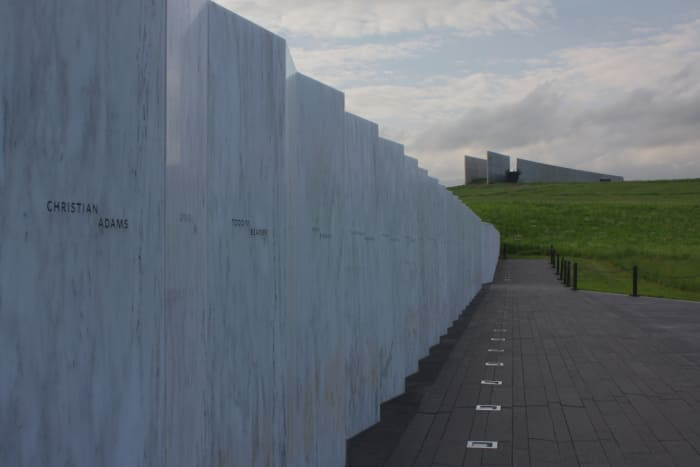 A Untied 93 memorial, to remember those passengers who brought down a hijacked plane in a western Pennsylvania, was developed by Los Angeles-based architect Paul Murdoch. 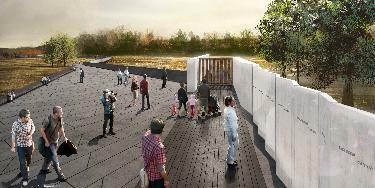 He envisioned a sweeping area of maples surrounding the crash site with low-lying sculptural walls. The memorial site is large and it converses with the rural Pennsylvania site almost seamlessly, incorporating natural ponds and other features of the landscape. So we see the variety of responses to that terrible morning of September 11, 2001, an event that took the lives of many and shook our entire nation. 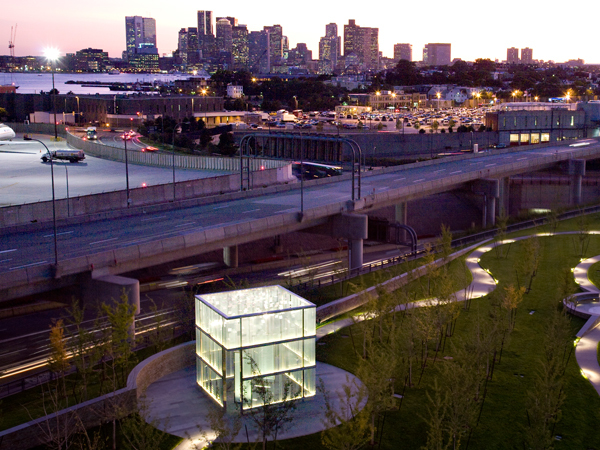 Boston's Logan Airport, where two of the four hijacked planes originated, dedicated its memorial on Sept. 9, 2008. It is a glass box, handsome if a bit cold. The Boston Herald quotes the daughter of a victim of the attack in its coverage of the memorial's dedication. She said: "It's difficult, but it being seven years later I think I can look back on it and remember my father more with a smile and less with tears," she said. "I think this is a celebration of their lives." The museum at ground zero was unveiled on September 11, 2011 commemorating the 10th anniversary, the spirit of mourning, loss and grief weighs heavily on each new I-beam, each pane of glass and each new tree, but so does the spirit of remembrance and celebration. To celebrate the lives so senselessly lost that day would be the best memorial.